Detroit scores four third-period goals to earn a 6-3 win. 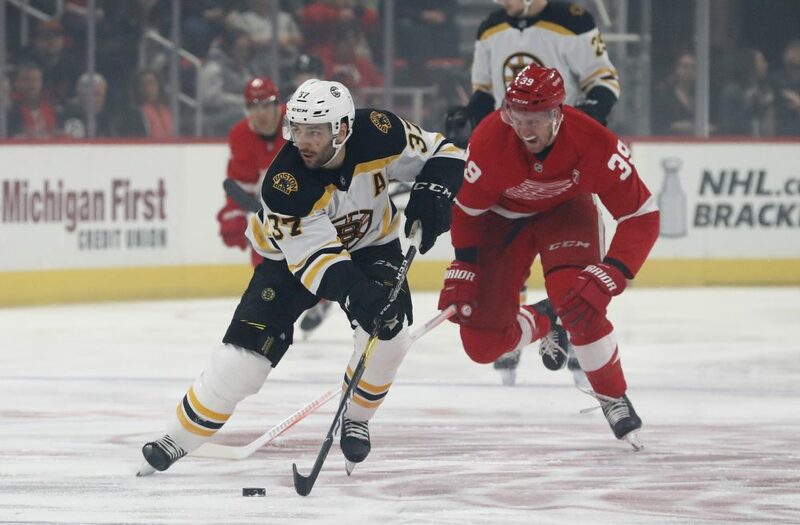 DETROIT — Taro Hirose scored his first NHL goal to break a tie early in the third period, just eight seconds after Anthony Mantha completed his first hat trick, and the Detroit Red Wings went on to beat the Boston Bruins 6-3 on Sunday night. Filip Hronek gave Detroit a two-goal cushion with 7:57 remaining, and Dylan Larkin added an empty-net goal in the final minute. The Bruins took a one-goal lead into the third period after David Backes redirected a shot into the net with a minute left in the second. Boston’s Jake DeBrusk scored early in the second, and Brad Marchand tied the game midway through the period with a franchise-record 26th short-handed goal. COYOTES 4, WILD 0: Darcy Kuemper made 36 saves for his fifth shutout of the season, Josh Archibald scored twice and Arizona kept its playoff push going with a victory over visiting Minnesota. Arizona moved within one point of Colorado for the second wild-card spot in the Western Conference with three games to play. The Coyotes, who have not made the playoffs since 2012, have won 10 of their last 12 at home. PENGUINS 3, HURRICANES 1: Matt Murray stopped 37 shots and the Penguins inched closer to a playoff berth with a win at home. Matt Cullen, at 42 the NHL’s oldest player, had a goal and an assist for Pittsburgh, which needs just two points over its final three games or a loss by Montreal to lock up a playoff spot. Carolina’s bid to reach the postseason for the first time in a decade took a hit. The Hurricanes are one point ahead of the Canadiens for the second wild-card berth. BLUE JACKETS 4, SABRES 0: Sergei Bobrovsky stopped 38 shots and visiting Columbus got its fifth straight win. The Blue Jackets jumped into the first wild-card position in the Eastern Conference, a point ahead of Carolina and two up on Montreal. Bobrovsky took over the NHL lead with his ninth shutout, and third in five games. RANGERS 3, FLYERS 0: Alexandar Georgiev made 29 saves and Ryan Strome scored for the third consecutive game as New York won at Philadelphia.